HUMDRUM THE HIPPO - an easy chapter book for younger children: read online, print or download as a free e-book. It was a hot, hot day. Humdrum and his family of hippos were lazily floating on their wide blue lake. "Somebody tell us a story," said Uncle Flatfoot. "Me! I will!" said Humdrum eagerly. "Oh, no!" groaned his uncle. "Why not?" asked Humdrum. "I love telling stories." "We know you do," said his Auntie Wagglebelly. "It's just that..."
"Never mind." His uncle sighed. "Go on, then. Tell us your story." Humdrum floated happily on the warm water, thinking for a moment. Then he began his story. "Once upon a time there was a little hippo who lived in the lake. One day he decided to swim across the lake. So he swam and he swam and he swam and he swam and he got across. Then he decided to swim back. So he swam and he swam and he swam and he swam and he got back. Then he decided to swim across again. So he swam and..."
Humdrum heard a faint splash. He looked around. Where had his family gone? He couldn't see them any more. Then he noticed their eyes and noses poking out above the surface. Usually the hippos would poke their ears out too: but this time, they had made very sure that their ears were under water. With a huge sloosh, Uncle Flatfoot raised his head out of the water. "What?" "You weren't listening to my story!" protested Humdrum. "Then what was it about?" With another huge sloosh, Auntie Wagglebelly raised her head. "It was about a little hippo who swam over the lake and back and over and back," she said. "That is the only story that you ever tell." "Oh!" said Humdrum. "But isn't it a good story?" Sloosh! "Only the first time," said his cousin Bignose, surfacing. Sloosh! "Not even then," said his other cousin Smalltail, with a tremendous yawn. "It's boring." "It's not terribly interesting," said his auntie. "All right," said Humdrum. "If you don't like that story, I'll think of a new one." He thought very hard. Then he began again. "Once upon a time there was a little hippo who lived next to the lake. He liked to eat grass. So he ate and he ate and he ate and he ate. Then he decided to eat the grass on the other side of the lake. So he swam and he swam and he swam and he swam to the other side and then he ate and he ate and he..."
Humdrum looked around. He was surrounded by ripples. The hippos' heads had disappeared again. Their ears were back under water. He could see their eyes and noses poking out - but now their eyes were closed. They weren't looking at him! They weren't listening to him! And worst of all, every single nose was snoring. Humdrum stopped in mid-sentence. What was the point of going on if nobody wanted to listen? Feeling quite upset, he swam away from the rest of the hippos and sat by the lake-side on his own. Widewing the heron flew down and landed on his broad grey back. "What's the matter, little hippo?" she asked. "Nobody wants to listen to my story," Humdrum said unhappily. "They don't think I'm interesting enough." "Don't worry, little hippo," Widewing told him. "I'll make you look more interesting, and my friends will help." Off she flew. A few minutes later, she came gliding back, carrying a flower in her beak. Behind her followed a dozen other birds, all carrying flowers or leaves or vines. They dropped them on to Humdrum's back. Widewing began to decorate him with the leaves and flowers. She draped a vine around his neck and balanced a blossom on his nose. "There!" she said. "Now you look much more interesting!" So Humdrum paddled over to his family. "Look at me!" he yelled. He was pleased to see them all sit up in the water, staring in surprise. "Do I look interesting?" he asked. "You do, rather," said his Uncle Flatfoot. "Oh, good," said Humdrum. "Now I'm going to tell my story!" He began his story about the little hippo. But very soon, his family began to yawn. They drifted off, sank below the water and closed their eyes. "Bother!" said Humdrum. "That didn't work." He shook the flowers off and swam over to the lake's edge again. "They still didn't want to listen to my story," he complained to Widewing. "In that case," said the heron, "it's your voice that is the problem. We need to make your voice more interesting." "How can we do that?" "Don't worry! My friends will help!" Away flew Widewing for a second time. When she returned, she was followed by a parrot and a baboon. The parrot flapped over to perch on Humdrum's head. The baboon leapt across the water to sit upon his back. "Who are these?" asked Humdrum. "Meet Screecher and Howler! They'll teach you how to sound more interesting," Widewing explained. "We certainly will!" screeched the parrot. "We're experts at making interesting noises!" yowled the baboon. They taught Humdrum how to screech like a parrot and howl like a monkey. He was a fast learner, and soon was very good at both. So he swam back eagerly to where his family were lazing in the water. "I've come to tell you a story!" he screeched. SLOOSH, SLOOSH, went the hippos as they sat up in a hurry. They gazed at him with their huge mouths falling open. "What's happened to your voice?" asked Auntie Wagglebelly. "It's interesting, isn't it?" howled Humdrum happily. And he began to yowl and screech by turns as he told his story. "...and then the little hippo swam and he swam and he swam and he swam and he ate and he ate and he ate..."
Yet strangely, no matter how loudly he screeched and yowled, his family still didn't seem all that interested. After a minute they started to yawn. Then, one by one, they disappeared back under water. "Bother!" said Humdrum, and he splashed off to the lake-side feeling most put out. Widewing came fluttering down to see him. "What's the matter now, little hippo?" "They still don't want to listen to my stories!" Humdrum wailed. "Oh dear," said Widewing. "Then maybe it isn't your voice at all. Maybe it's your stories that are boring." "No, they're not! They're about hippos swimming and eating!" "That's all hippos do," said Humdrum. Widewing scratched her head with her foot. "Hmm. I think you need something more interesting to happen in a story." "But swimming is interesting! And so is eating!" "Tell me your story," said Widewing. She sat down on the bank to listen. So Humdrum began to tell her his story. "...and then the little hippo decided to eat some more grass on the other side of the lake so he swam and he swam and he swam and he swam and then he ate and he ate and he..."
He looked over at Widewing. Her head had lolled to one side. Her beak had fallen open. Not even Widewing wanted to listen to his lovely story! Could it be true? Was his story really boring? Humdrum didn't believe it. He couldn't think of anything more fascinating than swimming and eating. Then he had a brainwave. "Maybe I can find someone else with interesting stories to tell. Then I can come back and tell them to my family!" This seemed like such a good idea that he set off swimming immediately. He headed off to the far end of the lake, where he had never been before. There, he began to look around for someone interesting. He saw a big fish poke its head out of the water. "Fish?" asked Humdrum. "Do you know any interesting stories?" But the fish just burbled and bubbled at him, and swam away again. Next he saw an ibis flying overhead. "Ibis?" he called. "Do you know any interesting stories?" "Lots!" squawked the ibis. "Sorry, can't stop now!" And it flapped away. Humdrum sighed. His plan wasn't working. "Hallo, little hippo!" said a voice nearby. "Did you want to hear an interesting story?" Humdrum turned round gratefully. "Oh, yes please!" he said. Then he frowned. Who had spoken to him? He couldn't see anybody there. Then he saw a nose poking out of the water. But it wasn't a hippo's nose. It was much, much longer; and it was greeny-brown. With a truly enormous SLOOSH, the creature surfaced. It was a crocodile. It was the biggest crocodile he had ever seen. Humdrum was not scared of crocodiles. If ever any swam too close to the hippo family, Uncle Flatfoot and Auntie Wagglebelly would roar at them, and show their tusks. And very quickly the crocodiles would go away. So he said eagerly to this crocodile, "Do you know an interesting story you can tell me?" "I know hundreds," said the crocodile with a wide and friendly smile. "Where do you get them from?" "I get them from all the interesting animals I meet," it answered. "Oh, yes. Lots of animals tell me stories before I eat - er, before I eat my dinner." "And can you teach them to me?" "I'd be delighted," said the crocodile, grinning. "Just come a little closer, and I'll tell you a story." Humdrum swam a little closer. "Will it be a story about a hippo?" he asked. "A hippo who swam and swam and ate and ate?" "There is plenty of swimming and eating in all my stories," said the crocodile. "Just come a little closer still, so that you can hear it properly." "Just wait a minute," Humdrum said. "Can I tell you my story first?" The crocodile closed its mouth again with a snap. "Of course. Go right ahead." "Then you can tell me what you think of it," said Humdrum. "I'd be delighted," said the crocodile. So Humdrum happily began to tell his story. "Once upon a time there was a little hippo who liked to swim. So he swam and he swam and he swam and he swam. Then he decided to eat some grass. So he ate and he ate and he ate and he ate. Then he decided to swim across the lake..."
After a while, the crocodile began to yawn. "Sorry," it said, "Just stretching. Does this story go on much longer?" "Why? Don't you like it?" Humdrum asked. "I love it!" the crocodile assured him. "Oh, good," said Humdrum. He really wanted to impress the crocodile. So when he went on with his story, he put in lots of extra swimming and eating. The crocodile's eyes began to close. "Hey!" said Humdrum. "Don't you want to hear the end?" "Oh, yes, please!" said the crocodile. "Wonderful story. I was just shutting my eyes so that I could listen to it better." Humdrum was delighted that the crocodile was enjoying his story so much. To please the crocodile, he made it even longer, and put in more and more swimming and eating. As he went on with his story, the crocodile's eyes slowly closed again. Its head went limp. Its tail went flop. Just then there was a sudden rush of wings overhead. Widewing hurtled down and landed with a thump on Humdrum's back. "What are you doing? That's the Giant Crocodile!" she panted. "I know," said Humdrum. "I'm telling him my story." "You're what?" she squealed. "Don't you know he wants to eat you up?" Humdrum stared at her in horror. And as soon as he stopped talking, the giant crocodile opened its eyes. "Oh, good!" grinned the crocodile. "A heron! I do like herons, almost as much as little hippos." It bared its teeth in a glistening smile. Widewing squawked in terror, tried to take off, and tripped over her own feet in her panic. She fell down on Humdrum's back with her legs all in a tangle. 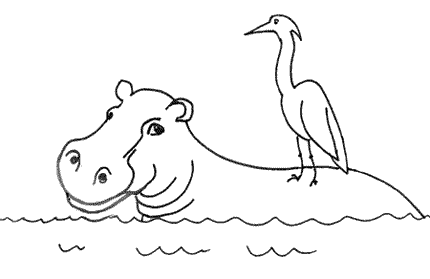 "Hippo for dinner and heron for dessert!" said the crocodile. With one swish of its giant tail, it was right next to Humdrum. He was trapped. He could think of only one thing to do. "But I haven't finished yet!" he said into the crocodile's mouth. His voice echoed as if he was in a cave. He went on in a rush. "The little hippo swam and he swam and he swam and he swam to the other side of the lake and then he decided to eat some more grass so he ate and he ate and he ate and he ate..."
The giant jaws opened wider yet in an enormous yawn. Still telling his story, Humdrum slipped backwards, out of the jaws, away from the wicked rows of teeth. "...then he swam and he swam and he swam and he swam..."
The giant jaws relaxed. The crocodile's head fell forward. Its eyes were firmly closed as it slumped into the reeds. Still Humdrum kept telling his story. He had never told such a long story before. While he told it, he very gently paddled round the sleeping crocodile. "...and he ate and he ate and he ate and he ate..."
He glanced around to make sure the giant crocodile wasn't following him. He couldn't see it any more. All the same, Humdrum did not stop telling his story until he had swum all the way back to his family. As usual, they were dozing in the water. By the time Humdrum joined them, Widewing was dozing too. "Wake up! Wake up, everybody!" Humdrum shouted. "I've got a really exciting new story to tell you, all about a giant crocodile!" With a series of slooshes, his family put their heads out of the water. Widewing sat up with a start. "The giant crocodile?" cried Uncle Flatfoot. "That horrible monster?" "Where?" "It's not here, is it?" exclaimed the other hippos, looking round in terror. "I met it down at the other end of the lake," said Humdrum. "It nearly gobbled Humdrum up!" squawked Widewing. "It had its giant jaws right round Humdrum's head!" At that, the hippos froze in horror and amazement. "How can you still be here? Tell us what happened, Humdrum!" begged Auntie Wagglebelly. "I decided to swim down to the other end of the lake. So I swam and I swam - until I saw a long, greenish-brownish nose poking out of the water. I had no idea who it was..."
This time, as they listened, not a single hippo fell asleep. Nobody's eyes closed. Nobody snored or drifted away. When Humdrum got to the bit where the giant crocodile opened its huge jaws to crunch him up, his cousins screamed. When he told them what it was like to stare down a giant crocodile's throat, Auntie Wagglebelly turned quite pale with terror, while Uncle Flatfoot trembled like a large grey jelly. "Don't worry!" Humdrum said. "I got away." And he went on with his story. By the time he finished, all the hippos were staring at him with open mouths and round, scared eyes. "Weren't you afraid?" quavered Bignose. "That crocodile sounds terrifying!" squealed Smalltail. "I wasn't terrified," said Humdrum. "I was too busy thinking about my story. I'm quite tired now, though." He rolled over and lay back in the water. "I'll just have a little sleep," he said. "Sleep? How can you sleep, after that?" wailed Bignose. "I don't think I'll ever go to sleep again!" groaned Uncle Flatfoot, still trembling all over. "I'll have nightmares. That story was far too exciting for me!" But Humdrum didn't hear. He sank his head beneath the water, all except his eyes and nose and ears. It was, without doubt, the best story in the world. Go to the list of free stories.